This photo was posted on the Facebook page of Manu Sareen, the Danish minister for Gender Equality, Church and Nordic Cooperation. The caption he added was "We moved our meeting out in the fresh air." Such is springtime in Copenhagen. You get out as much as possible. And nothing like a cargo bike to relax on. We do it here at Copenhagenize Consulting, too. 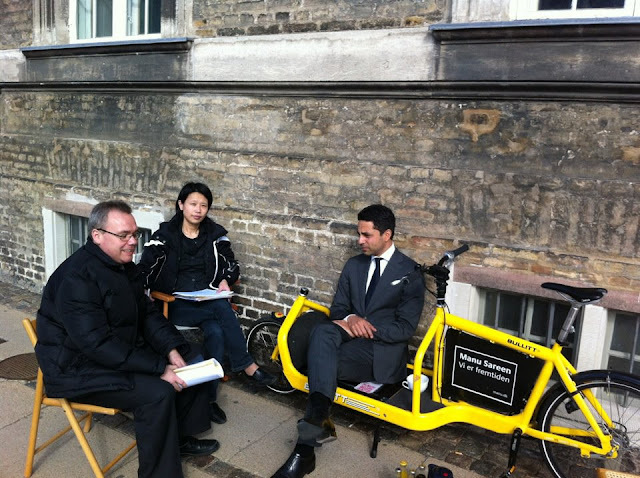 Sareen rode his yellow Bullitt to meet the Queen when the recent government was formed. Not a bad signal for a politician to send.